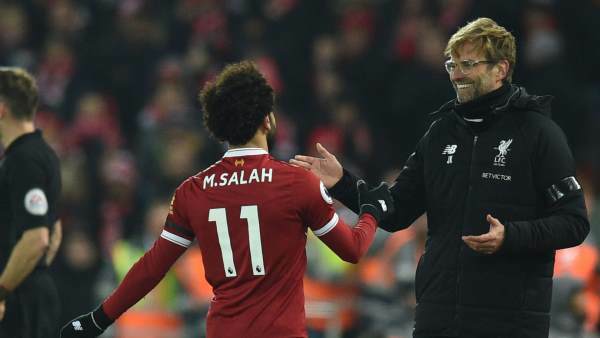 Jurgen Klopp has dismissed suggestions that Mohamed Salah is guilty of diving, saying there is too much scrutiny on the biggest teams in the Premier League. Salah was accused of flopping under a challenge from Mamadou Sakho during Liverpool's 4-3 win over Crystal Palace, though no penalty was awarded. Asked about the incident, Klopp said you can't call a player a diver because of one incident, and pointed to the fact that Salah earned and scored valid penalties in wins over Brighton, Arsenal and Newcastle leading up the Palace game. "This is the first situation where he went down without [a penalty] and you speak about all the other situations as well?" Klopp said. "There are other situations, much more obvious situations, that we don't talk about and nobody is talking about because it's not [Manchester] City, it's not [Manchester] United, it's not Liverpool, it's not Arsenal or it's not Chelsea. All the others can do it from time to time and nobody really talks about it. It's all fine. Klopp also pointed to an alleged dive by Leicester's Jamie Vardy against Southampton earlier this month, and suggested the striker was unlikely to be rebuked for his actions. "Did anyone talk to Jamie Vardy when, I forget the opponent [Southampton], everybody saw, you remember the situation?" the German boss added. "That was proper... he jumped in. Is Jamie a bad person because of that? I don't say now he is a diver. That is another situation. "You have them in the back, you are there, you feel something, do you have to go down? Probably not. I don't have to speak to players about obvious things. He knows that. Don't go down in situations like that."